Life is good for Laurie and Martha. They have three great kids, a much-loved home in the countryside, and after years of struggle, Laurie's career as an architect is taking off at last. Everything's perfect. Except, it isn't. Someone is about to walk into their happy family and tear it apart. Laurie has been hiding from him for years. The question is, now that he's found her, can she keep her family safe? And just how far will she go to protect them? Martha and Laurie have a totally solid family, with firmly entwined DNA – they each carried the other’s children, all from the same sperm donor. They love each other and flowing water surrounds them; their property is in the fens, there is a stream running through it, the ocean is a short drive away and two of the children are competitive swimmers. Martha is taking on more of the household responsibilities because Laurie’s career has taken off, but she is sort of OK with that – except for feeling she might like to have something of her own she doesn’t have to share – like meeting with her birth daughter’s new dance teacher, who wants to practice his life coach skills. Laurie decides to keep a small secret of her own too, a hidden room she finds in their house. So the solid family starts to develop minute cracks, not enough to be a problem really – except there are much bigger secrets in Laurie’s past. Secrets to do with the dry American desert community that obtained her as a child, for a purpose, and to which she returned a few years after being rescued from it as a small girl. As the book unfolds, the power of the desert starts creeping into the moist security of the family, making larger cracks that are harder to ignore. And Laurie’s purpose once more starts to play out. THE HIDDEN ROOM begins like the story of a family in the throes of change, as children grow up and parents start thinking of the next stage in their lives. But it slowly turns into a tale of psychological suspense. Even in as entwined a family as that of Martha and Laurie’s, the differences play out – the DNA connection between biological mother and child as opposed to the familial relationship between birth mother and child, the woman who feels basically safe and the one who has never really experienced safety. There are hidden rooms everywhere, in the family home, in the fens, in the desert, and inside the characters. And horrifically the strongest imperative appears to be the insidious power that men have over women. THE HIDDEN ROOM is a deeply disturbing book, and one that I pondered over long after I had finished reading it. 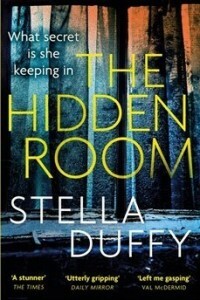 For another take on THE HIDDEN ROOM, read here.